What’s better than Banana Cream Pie? 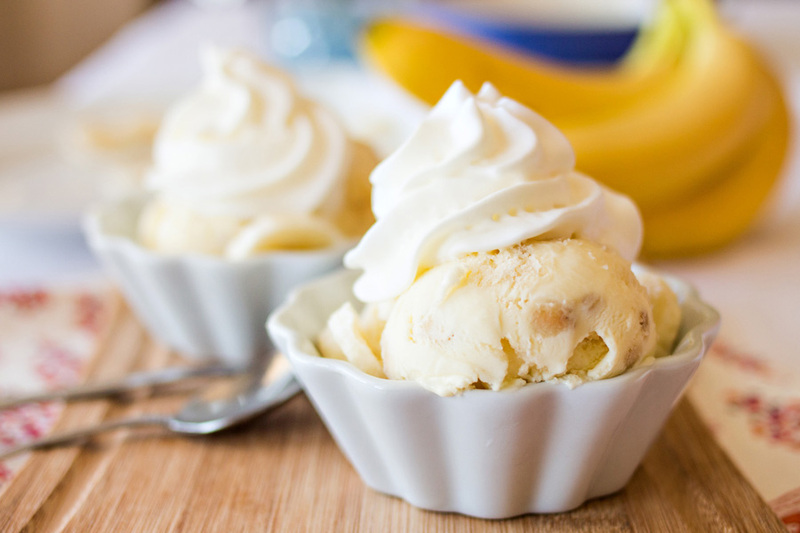 How about this Banana Cream Pie Ice Cream? My two favorite desserts just got married! Chronic stomach growling was something I was afflicted with for about five or six years. Through all my research, I could never figure out exactly what caused it, but I did discover that having banana cream pie for breakfast cured it. Every day of my high school career, my stomach would growl from 10:00 a.m. to 11:00 a.m. Every. Day. People asked me if I ate breakfast, and I did that every day, too. But I ate it really early, so by the time 10:00 rolled around, my body thought it was time for lunch already. Unfortunately, it was not time for lunch. It was time for 10th grade English, or History of Civilization. History of Civ, as we called it, was taught by the most boring teacher in the high school. He thought he was funny, but he was not, and despite our rolling eyes and snickers, he never got the clue. It was obvious that this man was completely clueless, because the girl who sat next to me on the front row painted her fingernails every single day in class, and he never said a thing. You would think that the smell would at least get to him, but he was oblivious. That’s probably why I got away with so much stomach growling in there. I wasn’t quite so lucky in my English class. It was torture for me, every day. I knew my stomach was going to growl, but I couldn’t eat banana cream pie for breakfast every day, so I had to come up with other ways to combat the problem. At the very least, I would always lean forward and cross my arms in front of my stomach to try to absorb some of the sound. Some days, I wore my jacket to try to further muffle the gurgling. But this was never enough. the day our English teacher announced that we were going to spend the whole class period silent reading, and she meant SILENT! Since being a teacher myself, I have come to realize that she did not do this for our benefit, but for hers. Either she hadn’t gotten her lesson plans done for the day, or she needed to buy some time to correct papers that she had promised to give back to the seniors, or she was just so sick of us that she didn’t even want to look at us any more, much less hear us or talk to us. (All of these are viable, respectable reasons, by the way). So surprisingly, we all shut up and started reading. For once, it was really, truly silent. Everybody’s heads were buried in their books, and you could tell there was real absorption of knowledge going on. You could just feel it. If you weren’t being distracted by your stomach, that is. A few minutes into the silence, I could feel a growl coming on. Through my vast experience with this, I had discovered that some growls were big and really required a lot of effort to cover up, and others were small–barely noticeable in fact, and needed little attention. I felt that this growl was going to be one of the latter, so I took no action. I did not cough, sniff, tap, rip, or even fold myself in half. I just let it happen. All of the sudden, a loud noise was heard, not unlike the cry of an angry bear. Instantaneously, 64 eyes were ripped from the pages of Lord of the Flies and came to rest on my face. My eyes were fairly popping out of my head due to the loud explosion. The silence had been shattered. Learning had been aborted, and decorum, dignity, and respect had been lost. Slowly, I turned my eyes from the smirking faces all around me and twisted my skinny little neck around to see if the boy behind me had noticed–the boy I had had a crush on all semester–the boy who for the very first time had sat behind me that day–the boy I hoped beyond hope had gone deaf the night before. “Hungry?” he asked, flashing me a huge, adorable smile. I just turned around, bent myself in half, and stared at my desk. I only had one small consolation that day. A boy on the other side of the room had gone to sleep and drooled on his desk. When he heard my stomach growl, it startled him, and he smeared his face in his drool. Bananas are well-known for having high potassium levels. Potassium reduces the risk of cardiovascular disease, stroke, and the formation of kidney stones. Bananas are also high in fiber, which aids in promoting regularity, treating diarrhea, and reducing the risk of colorectal cancer. The tryptophan in bananas also can play a role in preserving memory and elevating your mood. A London study found that children who ate one banana a day were 34% less likely to develop asthma. (See Bananas: Health Benefits, Risks and Nutritional Facts). I you love Banana Cream Pie as much as I do (or want to try a novel way to quell persistent stomach growling) you must try this ice cream! 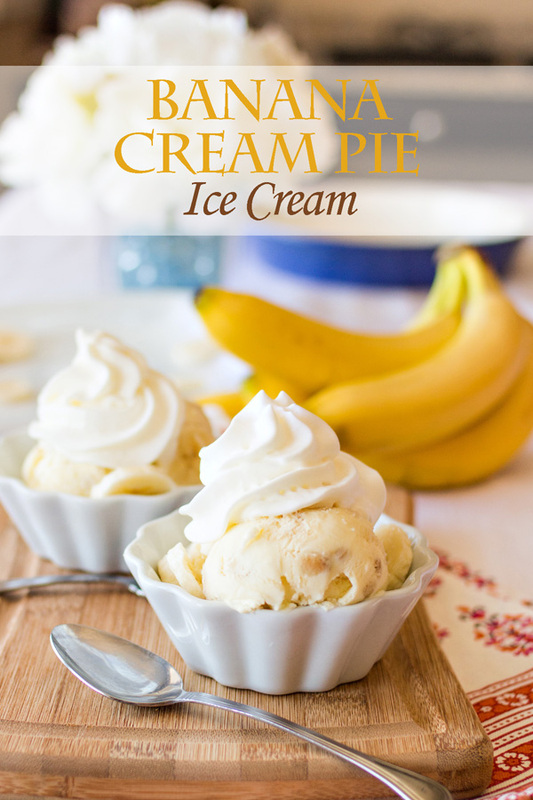 Creamy, smooth Banana Cream Pie Ice Cream that tastes just like your favorite pie! Complete with bits of pie crust and fresh bananas. Mix the whole milk and sugar together until the sugar has dissolved. Add the instant banana cream pudding mix and begin stirring. A couple of minutes before turning off the machine, add your small banana pieces. Let the ice cream continue to churn until the bananas have been well distributed throughout the ice cream. Transfer to an airtight container in layers, dropping the pie crust pieces on each layer. (You may only use about half of the pie crust). Serve with a large dollop of whipped cream. Be sure to check out Ice Cream Central for all my great ice cream flavors! Delightful story. I love your writing! 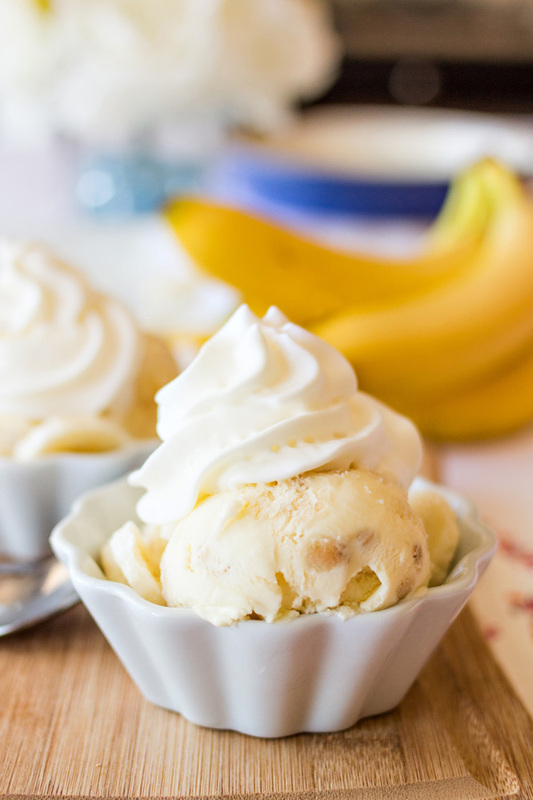 For the banana cream pie ice cream…. Did you mean to freeze overnight not refrigerate. Sounds wonderful. Stomach is grumbling. Love the story and the pie recipe! Oh my goodness!! That was a great story!! And ice cream is my ultimate weakness, especially homemade! Love the story… and the yummy banana pie recipe! Can’t get enough of banana cream pie, yogurt, and oatmeal, so I’m eager to try this ice cream recipe. Looks and sounds delicious. Thanks for the recipe and the wonderful way you presented it!